A novel mentorship program at Johns Hopkins taps into the unique strengths of undergraduate students. The goal is to support their path toward careers in medicine and neurology. In 2008, when Rachel Salas, MD, assistant professor of neurology at Johns Hopkins University (JHU) School of Medicine, was a new mother and suffering from burnout, she spent hours in front of her television binge-watching “Project Runway,” a Lifetime reality TV series that features amateur fashion designers competing with one another to create the best clothes based on a weekly theme. Their creations are judged by a panel of experts including host-supermodel Heidi Klum, and one or more designers are typically eliminated from the show each week. “It became the spark for an idea of how to structure a program to teach pre-med students despite my ever-increasing responsibilities and hectic schedule,” she said. That inspiration resulted in the PreDoc program, rolled out to 30 premedical students to date, which recruits around five undergraduates from the JHU Homewood campus every year to participate in research projects and other innovative assignments. As on “Project Runway,” those who succeed can continue in the program, and often go on to serve in leadership roles modeled much like residency — with interns, residents, and chiefs — while participating in scholarly projects with Dr. Salas and her colleague, Charlene Gamaldo, MD, medical director of the Sleep Disorders Center. “It is designed so that teamwork and learning occur reciprocally from top to bottom and vice versa (senior to junior and reverse) and side-to-side (peer learning),” Dr. Salas explained. To get a better idea of what that means, Neurology Today asked three graduates of the program to explain how this undergrad preceptorship differed from other traditional “shadowing” opportunities. Here they tell us in their own words about the “special sauce” that makes this recipe for education not only unique, but also the most highly sought after program of its kind on the Hopkins campus. In his first meeting with Dr. Salas, he found her open and engaging. “She responded enthusiastically to my interests in business processes and systems,” he said. Hou, who had gotten his real estate license before college, liked the fact that the PreDoc program encouraged students to set tangible goals for products based on their specific skills. As chief of the program during his senior year, he was tasked with the oversight and mentorship of 13 undergrads and responsible for delegating and coordinating projects with them. Anthony Kwan, currently a fourth-year medical student at SUNY Downstate Medical Center, has had a passion for drawing since he was young. “As I grew up and became familiar with technology, I taught myself basic drawing techniques, computer graphic design, and animation,” he said. His first presentation in the PreDoc program included only two small animation gifs, but Drs. Salas and Gamaldo, immediately recognized his passion, and encouraged him to explore his talent further. Kwan went on to teach himself video editing, and as he gained more experience, including working with a software engineer on the sleep team, he learned how to incorporate graphic design and video into mobile development. “The most unique experience in the PreDoc program included working as an animation artist for the iPad sleep apps MySleepScript, MySleep101, and Sleep Matters,” he said. Kwan began the PreDoc program in 2012 and became chief PreDoc, where he supervised new JHU undergrads. Even after graduation, he elected to continue various projects he had started, all because of what he described as phenomenal teaching and mentoring by Drs. Salas and Gamaldo. During his two-and-a-half-year tenure, he co-authored two review articles on restless leg syndrome and a book chapter in Principles and Practice of Sleep Medicine. His work in media development led to three more co-authorships. He also worked on a project to build a series of web-talks on clinical reasoning and clinical neurology. “I learned that I can combine my personal interest in graphic design and animation with teaching medicine to patients and med students,” Kwan said. He incorporated video in his poster on hypertension and stroke at the AAN Annual Meeting in Vancouver in 2016. Rebecca Choi, currently working as a research technician studying Alzheimer's disease, and applying to medical schools, entered the PreDoc program in the fall of 2013, and is now in her fifth year of the program. “For me, art has always been my way to spend time in peace and be creative,” she said. While working with Drs. Salas and Gamaldo, she participated in various projects to provide medically useful information to the general public, including creating an iOS app, flyers for patients at the Johns Hopkins Sleep Clinic, and designing “sleep socks” to assist Dr. Salas with creating a collection that is part of sleep hygiene awareness. She also drew signature polysomnography illustrations for various sleep disorders in Kryger's Sleep Medicine Review: A Problem-Oriented Approach; helped create videos on neuropharmacology, health disparity, and neuro-rehabilitation for the neurology clerkship at Hopkins; and converted the Sleep Matters app to a Korean version, as well as co-authored three articles. “I learned to collaborate with people from diverse backgrounds and how to be a good leader and co-chief,” she said. “Working with the PreDoc program gave me insight on how to embrace art as a way to communicate with others and convey complex information in a friendly and accessible way,” she said. Over the past two years, Dr. Salas has been working with the AAN in a variety of educational endeavors. She was appointed the AAN Chair to lead the Neuroscience Is... Rewarding initiative to spark interest in neuroscience at the college and medical school levels. She also serves on the Undergraduate Education Subcommittee and was selected as the AAN vice-chair for the Consortium of Clerkship Directors. Through the PreDoc program, Dr. Salas hopes to strengthen the pipeline of students going into neurology. She plans to soon pilot the program at other institutions by creating a competitive application process, “It's imperative to identify and implement new strategies to excite and engage future clinicians in neurology as soon as possible in their career,” she said. Rachel Salas, MD, refined her mentorship skills after participating in an online assessment tool called StrengthsFinder at the clerkship director leadership academy in Boston in 2017. StrengthsFinder was developed by educational psychologist Donald Clifton in cooperation with the Gallup organization to help identify the users' strongest personal traits. Dr. Salas learned from the tool that her number one strength is individualization, a characteristic that leads people to be intrigued by the unique qualities of each person. She has incorporated that approach in her work with the PreDoc program. Dr. Avitzur, who also was given the opportunity to undergo a StrengthsFinder assessment as a member of the AAN Board of Directors, will be co-directing a full day course for C7: Women in Leadership with Janice Massey, MD, on Saturday, April 21, 2018 at the AAN Annual Meeting in Los Angeles. The StrengthsFinder program will be offered to each of the attendees. Availability is limited. 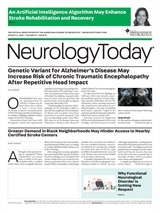 Neurology Today18(3):10-11, February 8, 2018.